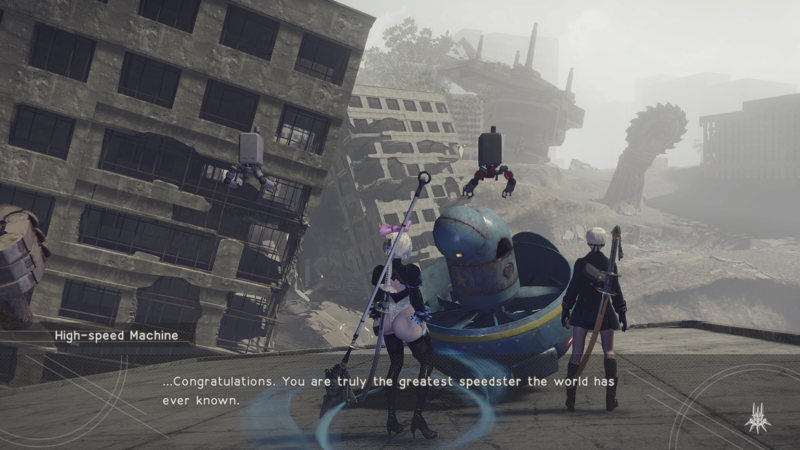 Yoko Taro, still unknown to many JRPG fans, has expanded the breadth of Japanese storytelling by taking the conventions of modern gaming and unweaving them into the common threads that not just make their respective genres great but also memorable. His latest contribution to the action RPG genre, NieR: Automata, brings together the unexpected with the exceptional combat framework that Platinum Games has made their trademark. Taking the role of YoRHa combat android 2B, players set forth on a mission to help reclaim the human motherland of Earth, some twenty-thousand years in the future. In that stretch of time, machines have taken over the landscape and thrown humans into a destructive spiral that culminated with humans having to take refuge on the Moon and wage small skirmishes in hopes of recovering that land they once called home. NieR: Automata, much like Yoko Taro’s other experiential offerings in the Drakengard series, continuously struggles with an identity crisis. Is it an action RPG? A sidescrolling platformer? What about a fishing simulator or visual novel? There are a number of striking similarities that link NieR: Automata with that of its predecessor, Nier Gestalt (or Replicant, depending on the region/version played). Platinum Games’ signature action is on full display in NieR: Automata. Taking that high-paced action and infusing it into a full-length RPG has been something I’ve wanted from the studio for years, and NieR: Automata certainly hits all of the right marks in terms of style and finesse. Main heroine 2B has access to a pair of load outs with two weapons and assisting Pod that she can swap between mid-combo for a bit more style. The other characters in Automata each have their own unique quirks, with the first such character trading in their secondary weapon slot for a unique ability to hack the enemy, suddenly changing the combat into a brief top-down shooter. What makes NieR: Automata’s combat shine so brilliantly is how flexible the playable androids perform in combat. In addition to the various weapon styles to swap between, each android has their own logic board of Plug-In Chips that can be swapped out (up to a certain memory threshold that can be upgraded at one specific shop on Earth). These Plug-In Chips can typically boost characters’ stats in predictable ways (melee damage and health increases come to mind), but also with a number of elements that can directly change how combat works. It isn’t until the latter half of 2B’s route that players might come across Chips that offer Counter or Overclock which directly can be attributed to abilities in other Platinum Games’ titles, MGR’s Parry and Bayonetta’s Witch Time respectively. NieR: Automata continually surprised me with adding additional layers of depth as 2B’s adventure expanded. 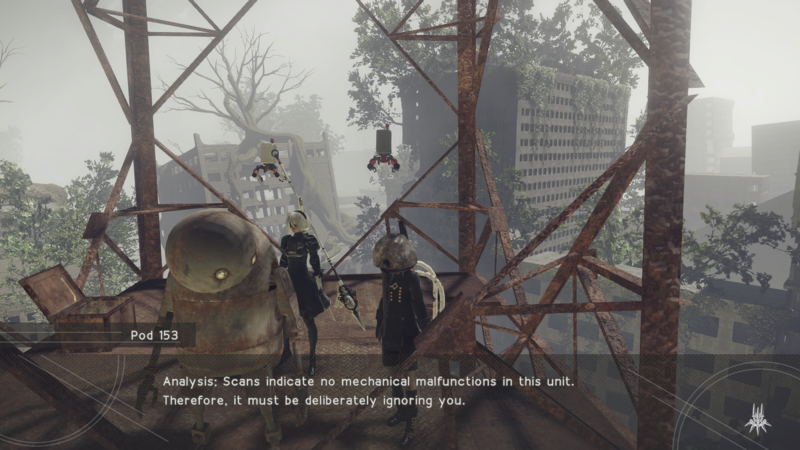 Players that have a firm grasp on how Plug-In Chips work in NieR: Automata may wish to play a more defensive role, or at least know when to pull back and heal. Taking a page out of Nioh/Dark Souls’ death system, whenever the player android falls in battle, they leave behind their old body along with a small pool of experience and more importantly their full loadout of Plug-In Chips. Failure to retrieve one’s body means losing whatever Chips were equipped, a fate that’s far more frustrating than losing a large stock of Amrita. Other player bodies can also be scattered around the battlefield to be collected, giving the player options to revive those bodies and either receive a temporary boost based on that android’s Chip loadout or force them to fight alongside 2B for a fair amount of time. Much like the bloodstains in Dark Souls, seeing a pile of android bodies scattered around the floor can usually be a good indication of an upcoming boss fight or surprise encounter. As much as I love the mashup of ideas that come from Yoko Taro’s creativity meshed with Platinum Games’ refined combat, there are a few rough spots that lack a sense of polish. The open world environment will feel quite familiar to players by the time 2B’s story wraps up and subsequent playthroughs won’t do much to revitalize that sense of wonder players will feel when they first arrive back on Earth. Shortcuts and fast travel options will help to cut down the commute time from one area to the next, but the roads will feel well traveled long before Automata’s story is complete. 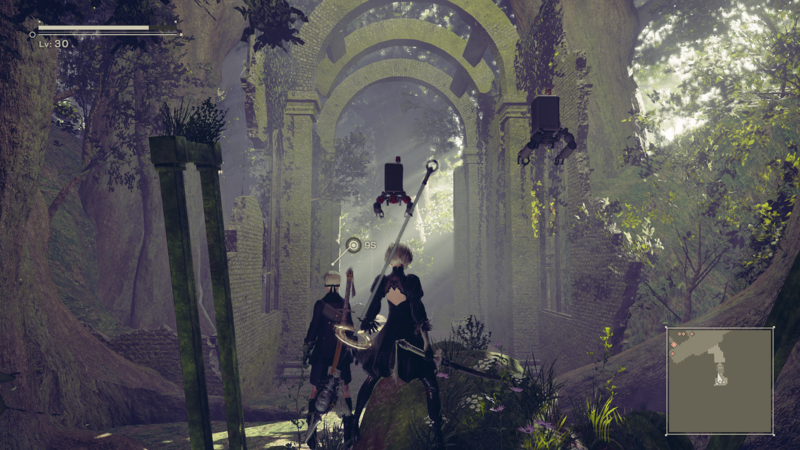 The environments are each with their own style and charm, most comparable to the original Nier, but there’s something lacking in this machine-infested Earth that prevents the experience from feeling as organic and lifelike as it properly should. It’s unfair to Yoko Taro’s legacy to compare NieR: Automata’s open world to the likes of Horizon Zero Dawn or The Legend of Zelda: Breath of the Wild, but as all three titles launch within the same window, there’s something to be said about how sterile the Earth has become in twenty-thousand years. Those looking for an open world sandbox to do whatever they want will be sorely disappointed. However, fans that treat NieR: Automata’s offerings as a buffet and sample a bit of everything will be filled with an experience that caters to those unique tastes that other open-world adventures might never match again. Review copy purchased. Game played on PlayStation 4.